Ever wanted to travel with your dog? Traveling with your dog can be done! 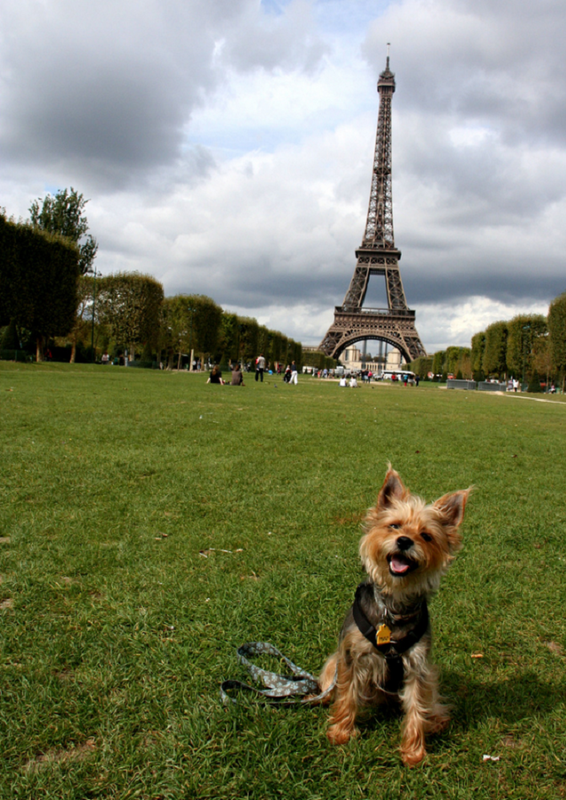 This is the story of Gigi, her dog Luna, and their life of international travel. This is one of many True Story interviews in which we talk to people who have experienced interesting/amazing/challenging things. Tell us a bit about yourself and how you’ve been traveling with your dog ! My name is Gigi Griffis. I’m 28. And I own my own business doing content strategy and writing work for clients all over the world. I also run a little travel blog and published a memoir this year. For fun, I love to travel, hike, camp, cook, and try new things (like hunting for lizards in Australia or dancing at a traditional Scottish Ceilidh). I also read like it’s going out of style. And tell us about your dog whom you travel with! Luna is a 3-year-old Yorkie Schnauzer mix. I found her a few days before my birthday and not long after a really bad breakup and she changed my life. She goes with me just about everywhere and is the best travel companion I could have hoped for. When/why did you give up your permanent address? In 2011, I was feeling really restless. I’d been living in Denver, Colorado for almost five years and I felt like I’d seen and done everything I wanted to see and do there. Honestly, I felt a little uninspired, stagnant, bored. I wanted to shake things up, to get inspired, and to inspire other people along the way.Plus, I wasn’t in a committed relationship, I didn’t own a home, and most (if not all) of my clients didn’t need me to come into their offices anyway, so there was nothing to tie me down.In May 2012, I said goodbye to my little rental house in Denver and hello to a sunny guest house room in Edinburgh, Scotland where I spent the next month taking Luna on walks along the Water of Leith Walkway and eating meat pies with gusto. Tell us about the logistics of your travel with a dog. The first is my destination country’s entry requirements. Many countries require an international microchip (an easy, one-time, out-patient procedure for your pooch), proof of up-to-date rabies vaccinations, and some paperwork that a certified vet can fill out for you saying that your pet is healthy and able to travel. For rabies-free countries, there are sometimes additional requirements (like tapeworm treatments or a rabies blood test). And there are a few very strict countries that require a quarantine or will only let your pet in from another rabies-free country. Once I know what my destination’s requirements are, I can plan accordingly. The second thing I research is transportation. Airline, ferry, cruise ship, train, and bus pet-friendliness varies by company and country. There’s always a way to get Luna into the next country, but not all transportation is created equal when it comes to pets! Finally, I always research vets before going to a new city or country. The name, address, and phone number of the nearest pet emergency room is one of the most important things I pack. Are there any countries you’ve opted not to visit because they’re not dog friendly? So far, no! I tend to believe that where there’s a will, there’s a way. And more countries are becoming pet-friendly every year. In fact, the U.K. just lifted its pet quarantine requirements in 2012 and Hawaii followed suit. We’ve already hit the U.K. since then and plan on checking Hawaii out soon. What’s it like traveling with your dog? Do you ever get homesick? My life of full-time travel isn’t actually so different from my life back in Denver. I still work pretty normal hours. I still make clients my number one priority. I still have to walk the dog and go grocery shopping. The real difference is that when I am done working for the day, I always have something new and different to explore. I can spend my lunch break eating sausage in a German farmer’s market or my weekends hiking the Swiss Alps. And as for homesickness…Anywhere with new friends (or old friends), a warm cup of tea, a good book, and Luna can feel like home to me. How do you deal with vet issues while you’re in foreign countries – particularly if they’re not English-speaking when you travel with your dog? When I’m researching vets ahead of time, I look for either: A) a website in English or B) reviews by English speakers noting that the vets speak English. If I can’t find these things (or to confirm), I generally send an email to the vet before I arrive asking if they speak English. I’ve had really good luck so far. 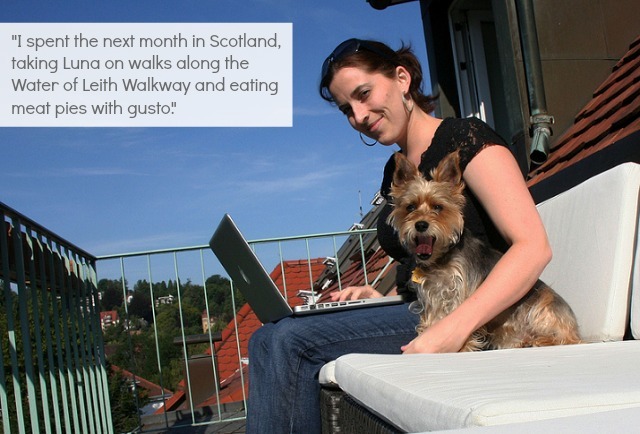 What do your friends and family think of your traveling, dog-owning life? Some think I’m crazy, some think I’m glamorous, and just about everybody thinks I’m interesting (albeit sometimes in a shaking-their-heads-incredulously-at-me way). What advice would you give to others interested to travel with their dogs? Always carry copies of everything and never freak out. Before you go to the airport/ferry terminal/guest house/etc., print out (or screenshot on your phone) the airline’s pet policy, any emails you’ve exchanged with customer service, the guest house’s confirmation that it’s okay for you to bring a pet, etc. If you end up talking to someone who isn’t well-versed in the organization’s pet policy, it’s nice to have those kinds of things on hand. Above all, don’t stress. Traveling with a pet is easier than I ever thought it would be. As long as you plan accordingly, you’ll be fine. Thanks so much for sharing, Gigi! Do any of you guys travel with your pets? How do you manage it? This makes me want to get a dog now! One of my main concerns was about how to travel if I had a pet. This sounds like an incredible life; I love to hear stories about people who are unhappy with their lives and then just pick themselves up and start doing what makes them happy, even if it's difficult! Thanks, Emily. It's pretty incredible and rewarding, for sure! I love this article!!! Pet travel IS stressful, but it's definitely easier than people imagine. When I moved to Costa Rica for a year, I took my cat with me. For the most part, life with my kitty in Costa Rica was easy and breezy (except for the time she almost ate an EXTREMELY enormous poisonous spider, and also the time when she ate a smaller, less poisonous spider–a few trips to the vet and she was fine). Definitely knowing your destination's pet-travel policy INSIDE AND OUT is very important. And having ALL THE DOCUMENTS with you, easily reachable, at all times. I actually had more trouble getting my cat out of Costa Rica when I left (despite having ALL the required paperwork) than getting her back into the States, which was my bigger worry at the time. Yikes on the spider thing! And, yes, you're right: it is stressful sometimes, but if it's what you want, it's incredibly worth it. Depends on your destination and length of travel! I know of a couple that took their two mid-sized dogs to Europe without putting them into cargo once. They cruised to the UK on the Queen Mary, then after exploring the UK they drove their rental car into Western Europe on one of the ferries, explored Europe, Croatia, and even Turkey, and returned the same way. How do you get around quarantine regulations? I thought it was 3-6 months for Australia. Quarantines vary pretty greatly by where you are going to and by where you are coming from. So far, we've only gone to places with no quarantine (UK, US, Mexico, France, Spain, Italy, Belgium, Germany, Switzerland, etc.). For these places, as long as you follow their instructions/paperwork to a T, you can walk right in. For places that do have quarantine (Australia, as you noted), I'll either A. wait until the restrictions change (both the UK and Hawaii, which used to have lengthy quarantines, now allow dogs to enter with no quarantine if you follow a strict set of guidelines – I expect other places will start to follow suit) or B. look into creative ways to reduce or eliminate quarantine (for example, Australia has a different quarantine length for dogs coming from rabies-free countries, low-incidence of rabies countries, and high risk countries. If you bring a dog to Aus from New Zealand, for example, the quarantine period is 0 days. If you bring a dog from a high-risk place, it can be four months…so it's all about where you're coming from in that case). out. I like what I see so now i'm following you. Look forward to finding out about your web page yet again.